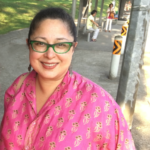 should a chair wear a saree? at its own risk, i guess. 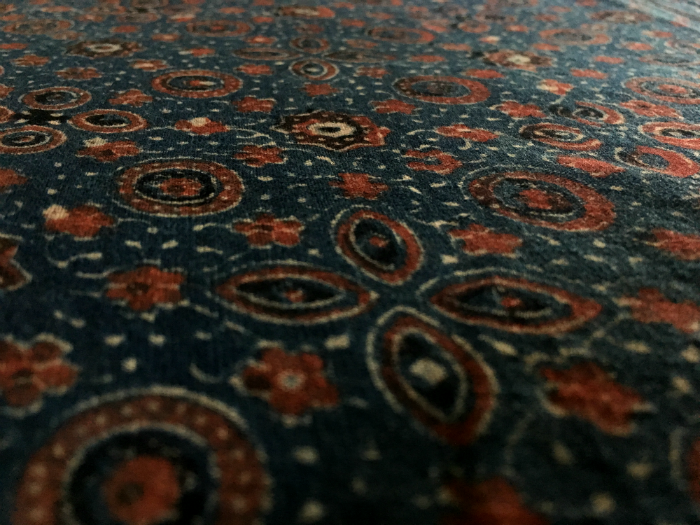 but i was staring at this wonderful kanjeevaram silk i’d just fallen flat for and instantly bought in bangalore on a recent trip, when i felt the wish to write something come and disturb my peace. what i fell for in this one were those tiny checks in mustard and the ganga jamna border in two different colours and yes, also the rich maroony pink colour… the checks make me think of my grandmother, she had the most beautiful off white and maroon check sarees from the south; the colour… it feels like the tones of the good old days, not a thread of new fangled in it; and the borders, an idea from where who knows named after two great rivers, but one that’s been around for years and yet never palled. 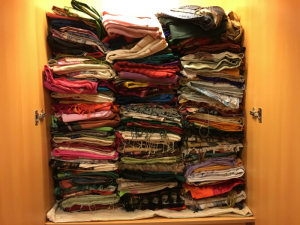 i was visiting a friend in bangalore, who i hope will have the patience to read this ramble, and we had hared off to see sarees in a couple of wonderful shops when we decided we had to go to chik pet, the old wholesale sort of market, to look at sarees. my cousin called me nri types. i giggled. when my friend’s mother heard of the plan, i thought she’d say we had lost it, who goes to that dusty, crowded market with narrow lanes and pickpockets and bulls all around (or some such thing that we casually come across in our good old non airconditioned, non departmentalised, non mallish shopping alleys and “pets”), instead she smiled in this dreamy way and said, rukmini hall, i’d got some sarees from there during my wedding… apparently this was a well known saree shop in chik pet back then. we ran to sir google… and there was the great hall, not mall. the very next day we were there. the driver was slightly disturbed at our choice of shopping venue and dropped us off at a convenient most inconvenient spot then disappeared into a covered parking lot. friend and i fearlessly jumped into the fray of row upon row and lane upon lane of shops with many wares, many wonders. sweat dust bikes autos cars carts fresh fruits and vegetables people… everyone and thing fairly intent upon running us over. and of course two clueless souls asking about some old saree shop would not get the directions they sought. the most happy saree shopping followed. 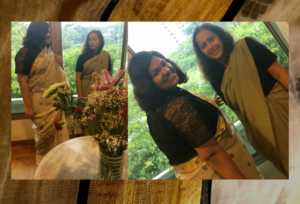 slowly, sitting on a gaddi, mulling over yards of silk and remembering things, laughing and exclaiming, oh see this combination… that one is just like a saree my ajji had… this grey and orange, you know that picture of my parents taken in a studio…? 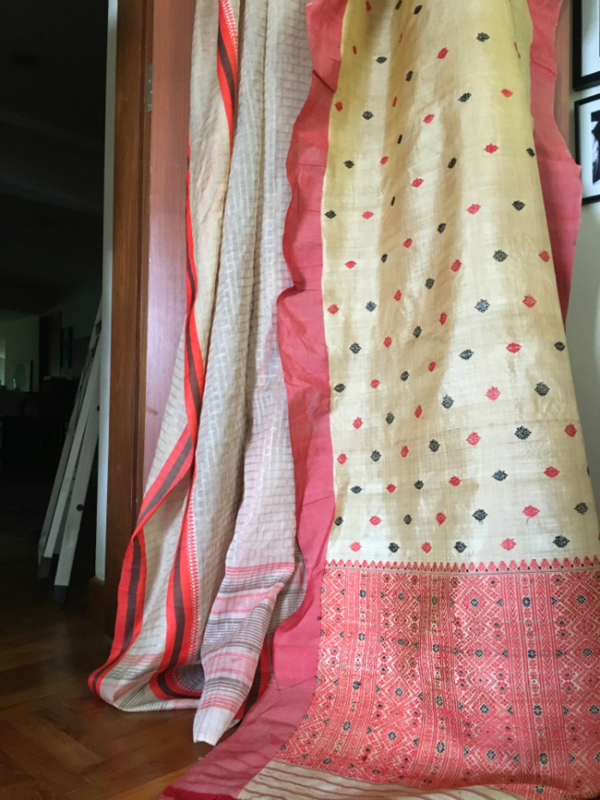 an elderly gent, with no agenda to push and sell and entice, took us through many different kinds of sarees from the looms of kanjeevaram and its neighbouring areas. we found colours and combinations we hadn’t seen anywhere else… the depth and tone of colour was somehow different. 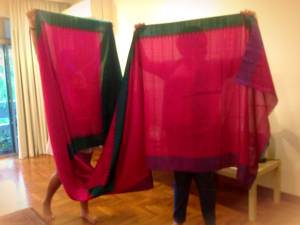 not “upgraded.” i quickly chose three sarees. the silk felt right, the price too… most of all, the atmosphere and demeanour. was just reading a bit about kanjeevarams. silk weaving grew in prominence during the reign of krishnadevaraya, that’s early 1500s. 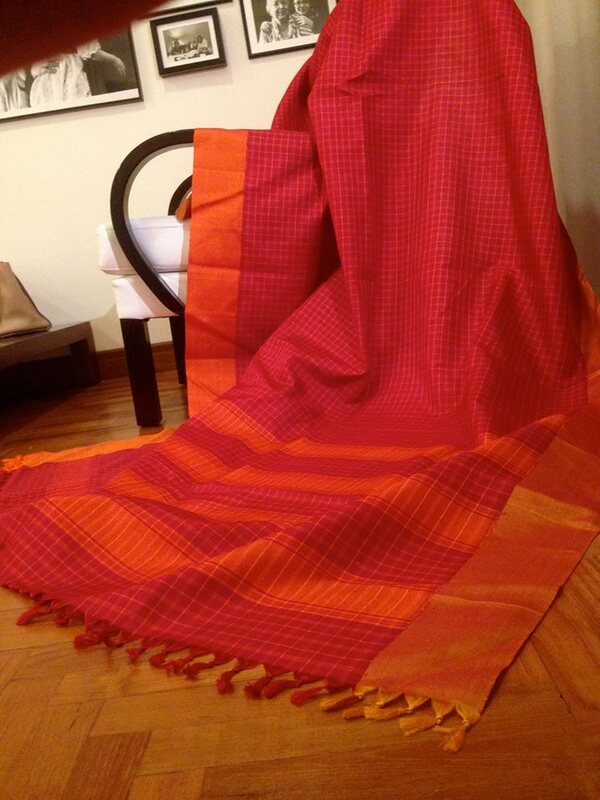 experienced silk weavers from andhra came and settled in the region and business took off. and to my surprise, i found silk is a fairly new material to the weavers of the town of kanchipuram/kanjeevaram… they traditionally used cotton. it was only about a hundred and fifty years ago that silk kanchipurams started being made and then became the rage… ha, got to have your kanjeevaram collection m’deah! 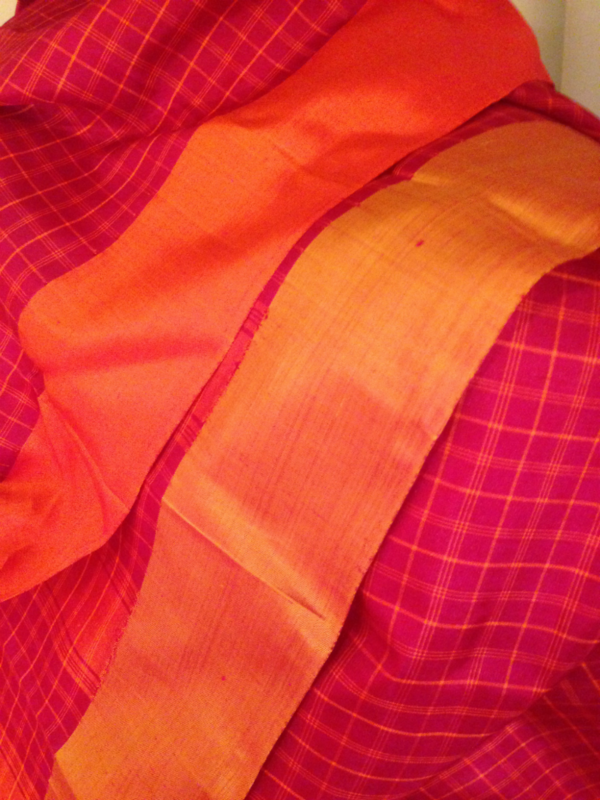 before that, the silks or pattu pudavai were woven in the thanjavur-kumbakonam belt, arni and salem. the gentleman at the shop knew the diff between an arni and a kanjeevaram. i felt happy just remembering that. Wow, that saree brings my mom to mind! That’s her kind of sari, only thing she would prefer it in handloom or cotton instead of silk. hi ladki k, thanks. it’s nice, na. reminded me of another time. and yeah, seems kanjees used to be cotton sarees earlier. Lovely. 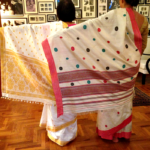 Oh those checked sarees, I think every woman around here owns one such saree. Kanchi sarees are quite famous. Yes, the shoppers can make out which ones are from there and which not. Kanchipuram has unique showrooms. Many have their weaving and selling points at the same complex. Some are also made to order. Also, some shops rent out rooms for overnight stay for outstation customers. 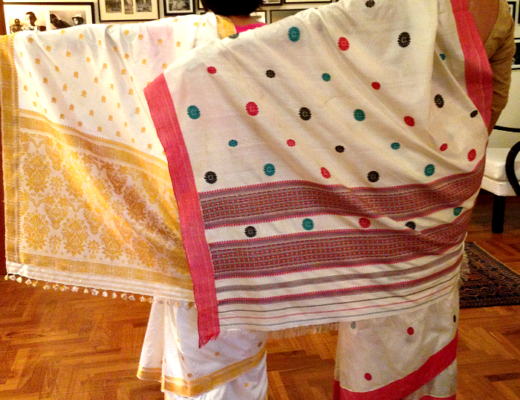 And the variety of sarees they display are countless. Indi, beautiful sarees like these never fail to give pleasure each time you wear them. I love the ceremony that goes with shopping for them in India. How you’re shown them piece by piece, how the shopkeeper gauges your reaction, and then slowly brings out his best ones. 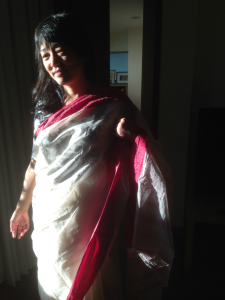 It’s amazing how six yards of cloth can adorn the female form with such exquisiteness.